AXA Group CEO Henri de Castries talks about change and morality in business. 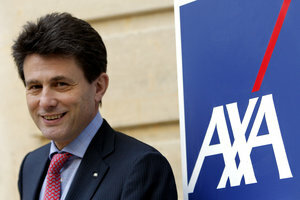 AXA CEO Henri de Castries (AP Photo/Christophe Ena). Change is constant. But so is fear about change. I for one used to loathe change; I viewed it as a wrecking ball of chaos and confusion, a “nothing good can come from this” situation, a date with death (to be dramatic). Moving homes used to disrupt my thinking, my behavior, my normal daily routine… And thinking about it – and fearing it – during the lead-up made change that much more difficult to handle. When I entered the workforce I came to realize that change is what drives progress, what drives innovation (and vice versa) and what, eventually, drives success. For to resist change is to dig an early grave for your business. I’m not trying to be some sort of motivational business philosopher. This has all been written about before in countless business management books, and has been preached before by many successful business pioneers, one of them being Henri de Castries, AXA Group chairman and chief executive officer. I was fortunate to be invited to hear Henri speak at AXA Group’s international media seminar in Sauternes, France, last month. In a chateau on the French countryside filled with press from around the world, Henri spoke at length about shifts in the economy, in consumer behaviors, in natural disasters and, most of all, in technology. He spoke about change. Profound words from the eloquent leader of Europe’s second largest insurer. According to de Castries, we are at a time where we are seeing a big economic and technological earthquake; where the proverbial plates of economy are colliding with the plates of technology. He used the example of Google driverless cars. The assumption that every car has a driver is just that – an assumption. In the case of driverless cars, there is no requirement for a driver, but the risk of driving remains. That will not change, will not disappear. De Castries also pointed to the fact that big data has changed – and will continue to change – the world and the way we do business. Just a few years ago, advisors collected data on a client or prospect when they met, learning about their risk appetite and financial goals along the way. Now, advisors have the ability to “understand the customer way better than he can understand himself,” as de Castries noted. And sometimes, even before the first meeting. In the end, even though there is a need for change, there will always remain the same risks, whether business or moral in nature (or both). It’s up to us to choose wisely.